An illuminated LED indicator light ensures you always know when your speaker's microphone is active. Or turned off. Sonos One is designed with extra security - the hard-wire LED connection ensures no one is listening when you want privacy. Sonos One is built with custom 6-microphone array to hear you from anywhere in the room, no matter how loud the music is playing. With smart voice capture and noise cancellation, the Sonos One ensures you're heard. Playbar´s nine-speaker design floods your home with huge waves of epic, full-theater sound for TV, Web, Movies and Video Games. It is also a stand-alone all-in-one Sonos player that allows you to wirelessly stream all the music on earth-your iTunes library, your favorite music services, and thousands of Internet radio stations, shows and podcasts. 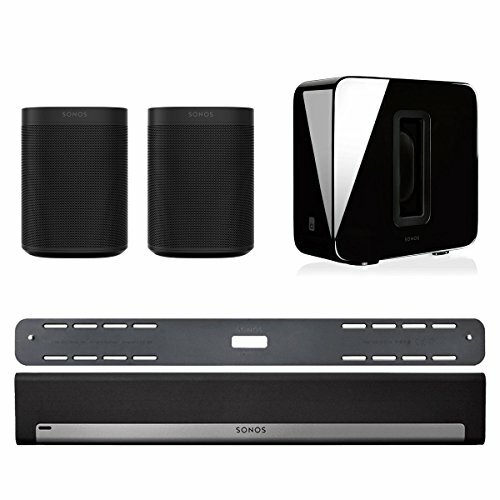 Connect Playbar or Bridge to your wireless router and link all Sonos players wirelessly with one touch. NOTE: To get started, you must wire either one player or Bidge to your home network using a standard Ethernet cable. Fills an entire room with thick layers of deep, bottomless sound that let you hear and feel every chord, kick, splash and roll. You won't just hear the difference our wireless subwoofer makes - you'll feel it. Two force-cancelling speaker drivers positioned face-to-face means all the sound and energy from the music comes through loud and clear.